Sachin Sarath Kothandaraman is a regular listener. In fact, this is his second time to win a ScienceMatters quiz. The first time was for Season 1. 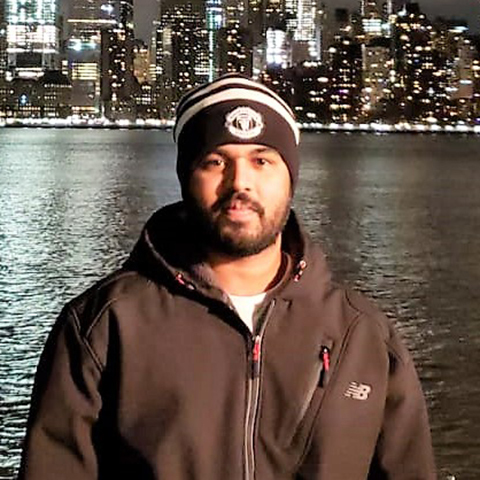 Sachin is pursuing a master's degree in bioinformatics. He works in the lab of Fredrik Vannberg, developing an open-source data analysis platform for multidimensional analysis of tumor data from individual patients. The goals are to improve prediction of individuals' response to drugs and to understand the microenvironment of tumors. Home for Sachin is Chennai, India. He listens to ScienceMatters during breaks from work or in the gym. ScienceMatters "is a wonderful medium to talk about the amazing research in the College of Sciences," Sachin says. "The podcasts are brief, easy to understand, and fun and effective in making current research accessible to communities within and outside of Georgia Tech. As quiz winner, Sachin will take home our popular periodic table T-shirt and our exclusive ScienceMatters business card holder, pen, and note pads. Join ScienceMatters Quiz 6 for a chance to win fabulous prizes. According to Episode 6, what is the usual time it takes for mammals to urinate? by April 23 for a chance to win an exclusive ScienceMatters gift. Winners will be announced as soon as we reach them. What is earthquake “music?” Can coral reefs devastated by climate change be saved? Does science support the supposed benefits of meditation? More tales of curiosity and discovery are coming in Season 2 of ScienceMatters, the podcast of the Georgia Tech College of Sciences. When the Earth’s tectonic plates collide and slide, School of Earth and Atmospheric Sciences Professor Zhigang Peng takes data from seismic sensors and creates “earthquake music.” The results can help scientists learn more about what goes on beneath the planet’s crust. There’s more to meditation than just chanting mantras in your favorite yoga studio. Practitioners claim the benefits include better mental and physical health. Does the data back that up? School of Psychology Professor Paul Verhaeghen researches the science behind meditation. Glaucoma usually affects older people, but a form of the eye disease can strike younger patients, including children. That keeps School of Chemistry and Biochemistry Professor Raquel Lieberman hard at work studying wayward proteins that may hold the key to new treatments for the second-leading cause of blindness. One of the top algae scientists in the world, award-winning School of Biological Sciences Professor and Chairman Mark Hay, gives a grim prognosis for the world’s coral reefs. First of a two-part episode. In Part Two of our podcast with School of Biological Sciences Professor and Chair Mark Hay, the scientists says some coral reefs damaged by climate change could heal themselves – if given the chance. Kennda Lynch studies ancient lakes on Earth that serve as stand-ins for Mars’ formerly-flooded craters. The School of Earth and Atmospheric Sciences postdoctoral researcher helps NASA look for potential landing sites on the planet, while also helping to build Georgia Tech’s astrobiology community. Mostafa El-Sayed, Regents Professor and Julius Brown Chair in the School of Chemistry and Biochemistry, is working on a promising cancer treatment based on gold nanoparticles. His work is inspired by, and dedicated to, his late wife, who died from the disease. Season 1, Episode 9: The Mathematics of ... Donuts? School of Mathematics Professor Dan Margalit describes the beauty and creativity in his research area, topology, while we reveal its connection to the oldest of math jokes. Margalit also offers ways to help students overcome fear of mathematics. What is “memory clutter”? Can we make it go away? Audrey Duarte, an associate professor in the School of Psychology, uses magnetic resonance imaging and special tests in her Memory and Aging Lab to discover what causes obstacles in the brain’s pathways as people age. At Georgia Tech, one of the top research universities in the world, much of the curiosity-driven discovery is happening in the six schools of the College of Sciences. ScienceMatters will bring you the compelling stories behind the award-winning faculty and enterprising undergraduate and graduate students who are advancing what we know of our world and beyond. Want to hear more about the next-level scientific research happening on North Avenue in midtown Atlanta? Subscribe to ScienceMatters, the podcast of the Georgia Tech College of Sciences.